An ancient fort, a balancing rock, a shrine and a barbell | Where to next? 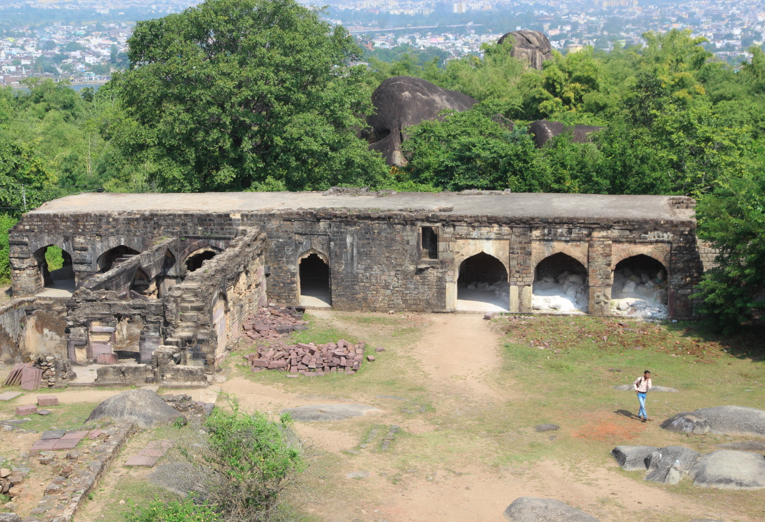 After Pisanhari Temple, the Madan Mahal or Durgavati Fort was next on our list of must-see sites in Jabalpur. It’s a miracle we—Renae (one of two friends travelling with us on this overland), Poor John and me—even got there. The guidebook says the fort is six kilometres out of town on the way to Marble Rocks (another site on our list). We crossed the road so we were heading the right direction and flagged down a tuk-tuk, known as an auto rickshaw in India. With a few words of Hindi (namely Madan Mahal, Madan Mahal) and much waving of hands we settled on the price and destination. Of course, it was shock when the fellow drove on 30 metres and did a U-turn and headed back toward town. He insisted he was going the right way, we insisted he wasn’t. He stuck to his plan and we decided it didn’t really matter where we ended up—it was still an adventure. Before long we turned right onto a narrow side road that took us past the Balancing Rock. 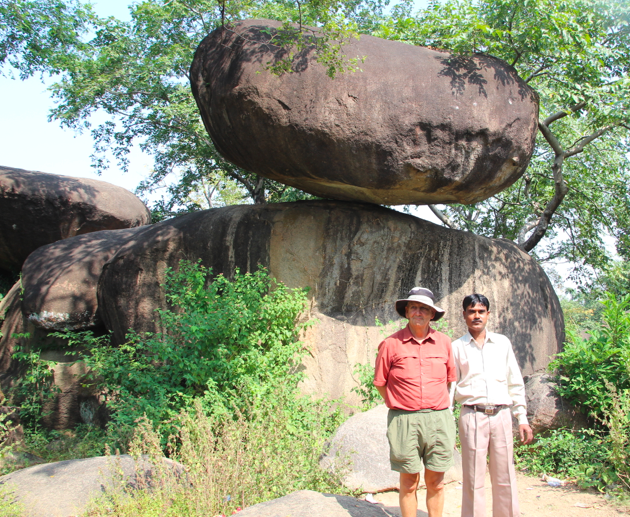 The guidebook says the Balancing Rock is on the path/track leading to the fort, so unless there are two such rocks in town, we knew we were heading the right way. The driver stopped briefly and led us to the rock where I snapped a pic of him with Poor John and the rock, which has survived many earthquakes over the centuries. 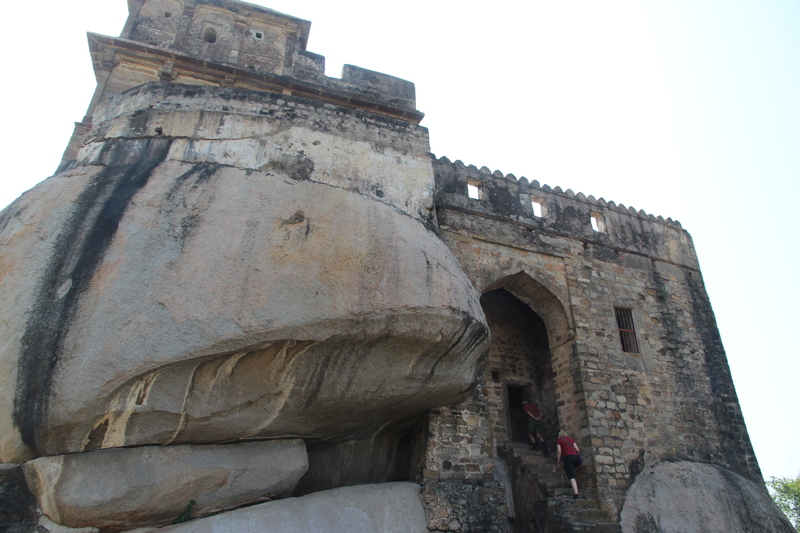 Then it was on to the base of the stairs leading to the fort. Luckily, there are two catch-your-breath-and-take-a-photo stops on the way up—neither of which gets a mention in the guidebook. There’s a picturesque lake and a small shrine, complete with offerings, tucked into an outcrop of large rounded boulders that have been painted blue. Renae couldn’t resist stopping at the makeshift ‘gym’ attached to the shrine and give the homemade barbell a couple of lifts. And finally we reached the fort. Built in the 11th century by the Gond rulers, the Madan Mahal fort is strongly associated with Rani Durgavati, the Gond Queen, and her son, Madan Singh. 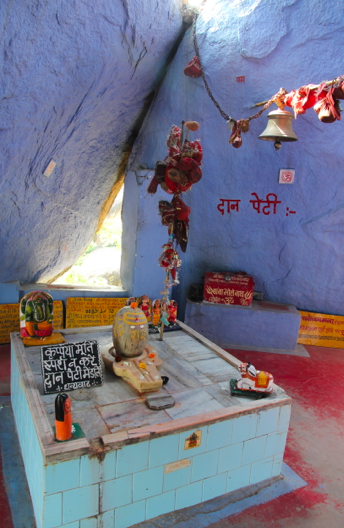 She is also credited with building many temples around Jabalpur. Rani Durgavati eventually died fighting the Moguls, and Indian history hails her as a martyr. The compact fort served primarily as a watchtower, where troops kept a lookout for invaders. In addition to the fort, there are three other structures—a stable, a small reservoir and a pleasure chamber for the rulers. None of these are marked and your guess is as good as mine as to the pleasures that were taken. The stable—or what we assumed was the stable—has an interesting ceiling design that is reminiscent of Arab constructions. Quite a few Indian national tourists visited while we were there. 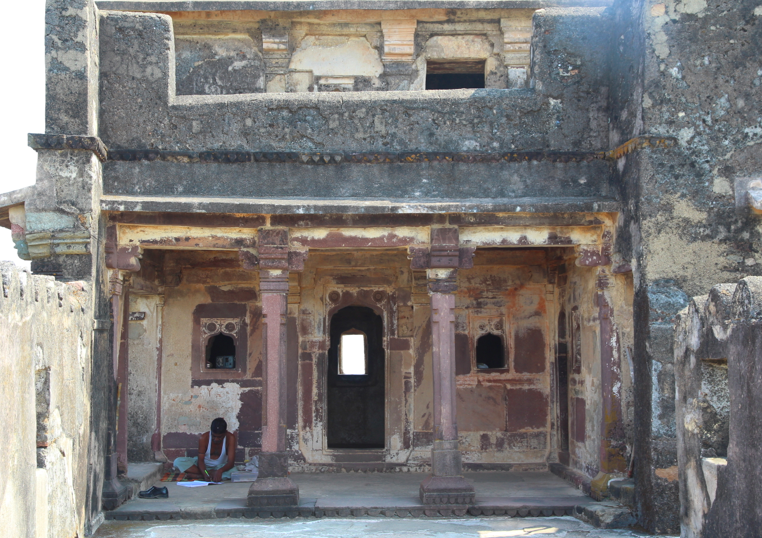 One fellow was ensconced upstairs and treating the fort as his own personal office. From the upstairs, we could look across to the Pisanhari Temple we visited the day before. Rumour has it that there is a long a underground tunnel that was used as a possible escape route and to transport artillery. There is also, supposedly, a Gond treasure of gold bricks hidden somewhere on the grounds. We didn’t see anyone prospecting. When we’d thoroughly explored the fort and surrounds, we walked down the hill and back to our hotel—just over two kilometres. So much for the fort being six kilometres from town. I get annoyed with guidebooks. This one must measure from the centre of town and, while we stayed nowhere near the edge of town, our hotel was well past the six-kilometre mark. It would help if they made it clear on their measurements work. Lesley, there’s still a bit of room in the van. We’re going tiger hunting tomorrow—with a camera of course.